The Alphacool Aurora Flexlights RGBW-LEDs are the ideal solution to illuminate your PC, especially when it comes to modding. RGBW LEDs are superior to normal RGB LEDs in terms of colour and luminosity. 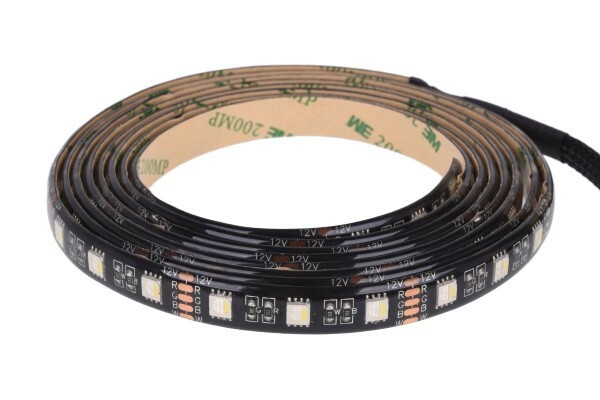 Of course, RGBW LED strips can also be used to illuminate anything else that you would want to in your home, mood lighting in the living room, an under light for the bed in the bedroom, cabinet lighting in the kitchen – so much is possible. If you use the Aurora RGBW LEDs in your PC, you can connect and control them with various compatible controllers. The biggest advantage of RGBW-LEDs compared to standard RGB-LEDs is the ability to reproduce the colour white. Normal RGB LEDs can only produce a rather cold and slightly off-white, however, RGBW LEDs can also produce a perfect white. This is simply because RGBW LEDs use a white LED in addition to the red, green and blue LEDs. This also explains the higher overall luminosity. The connection is made via a 5-pin female RGBW-LED connector. A female-to-male adapter is also included. Thus, the Alphacool Aurora Flexlight can be operated at any RGBW connection. There is an adhesive strip on the back to ensure the Alphacool Aurora Flexlight can be easily attached to the surface of your choice. Of course, Alphacool offers different lengths from 30 cm to 500 cm so everyone will find the right size.